Will Bigger Wheels Change My Fuel Economy? Pickup truck owners frequently purchase their vehicles with the intent to modify them as soon as possible. 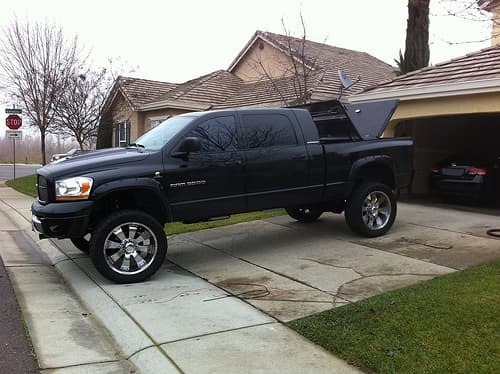 Some want lift kits, overhead lights, roll racks, or spray-in liners. Others want distinctive paint jobs, pinstripes, or a camper shell. It is common to purchase aftermarket accessories and packages to convert a standard pickup truck into a dream truck. One of the strongest trends is adding bigger wheels, commonly referred to in the truck world as plus-sizing or upsizing. Tire manufacturers have created wider, taller, and knobbier tires to replace the stock versions that come on standard pickup trucks. Owners like the look and feel of larger wheels, and most are willing to sacrifice comfort and road handling. Researching bigger wheels, many drivers wonder if they will lose fuel economy by plus-sizing. The answer is a resounding yes. Years ago, standard factory vehicle tires were 15 inches in diameter. Contemporary tires are bigger, typically 16 to 17 inches, and often wider than their previous counterparts. Installing larger tires on a pickup truck will add weight, diminish acceleration, and lower fuel economy. Bigger wheels have a greater rolling resistance, causing a reduction in miles per gallon. It takes more work for the engine to propel a heavier vehicle. Generally, the bigger the tires, the more your total gas expenditure will be on a regular basis. Installing bigger wheels on a pickup truck is sometimes as easy as selecting a tire slightly larger than the stock style currently installed on the vehicle. Many pickup trucks can comfortably accommodate wheels as big as 28 inches in diameter. However, if selecting a drastically larger wheel, the owner needs to consider the size of their wheel well, and decide if they want to do serious surgery on their existing fenders, camshaft, suspension, or brakes. Tires rubbing on any part of a pickup truck will cause serious damage to the truck as well as the tires. In addition, when installing bigger tires, it is crucial to have the speedometer recalibrated to preserve the integrity of your speed and traction control settings. Deciding whether to install bigger wheels on a pickup truck is a matter of personal opinion. Truck owners have several factors to take into consideration, but often the biggest consideration is image, cosmetics, or individual preferences. Owning a pickup is often a lifestyle. Vehicles can be a reflection of the driver, and driving a pickup truck speaks volumes. While fuel economy will suffer with bigger wheels, that may not be the overwhelming factor in deciding if you will install bigger wheels or stick with the original tires.